36 Hours, my favorite part of the Times Travel Section, finds itself in San Juan, Puerto Rico this week. Featured in the piece is Hotel El Convento, a beautiful example of Spanish colonial architecture and design and a European-style alternative to glitzier properties. It has almost convinced me to put Puerto Rico on the top of the travel list, particularly because my husband has insisted we go somewhere tropical before returning to Europe. 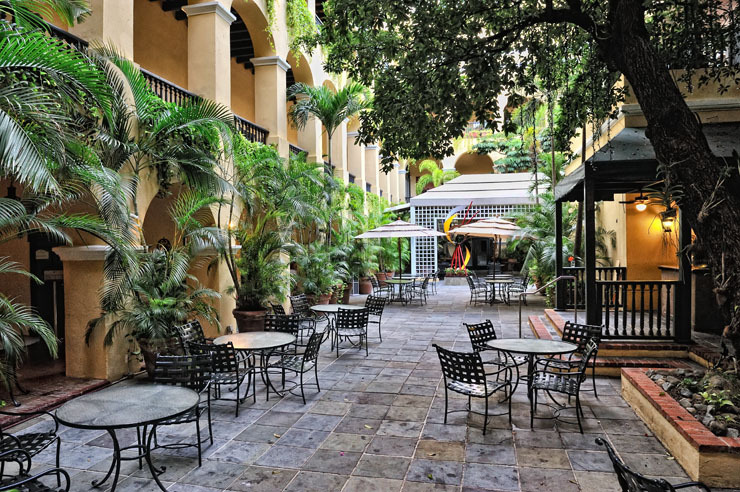 Hotel El Convento is an Old San Juan institution right on the water. It was founded as a convent and housed Carmelite nuns for 250 years. Since then, the structure was rebuilt in 1959 on the foundations of the original. Check out its grand open-air courtyard and more on the hotel’s photo gallery. Looking for a hand-fitted, customized Panama hat? The article also suggests the best hat maker in town. 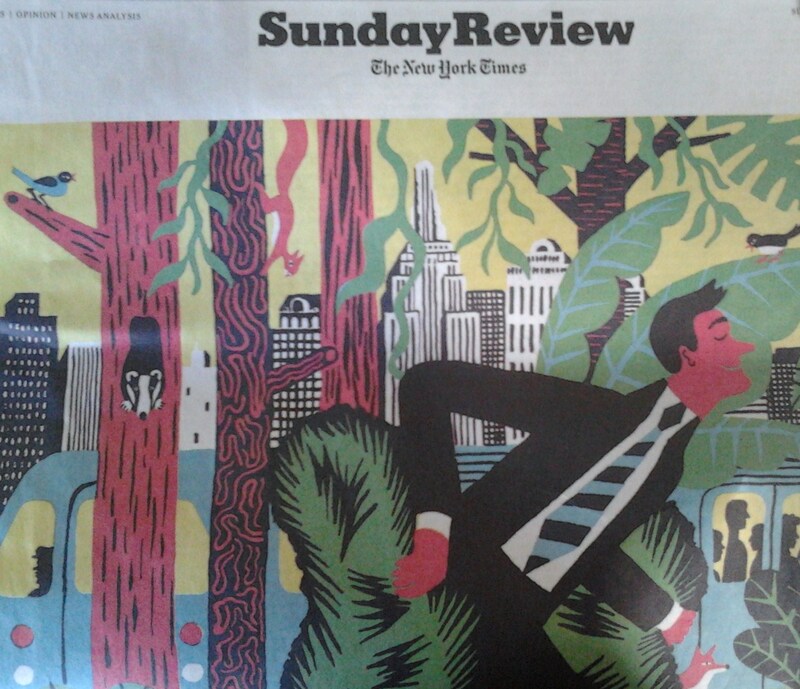 Sunday Review’s cover article “Relax! You’ll be More Productive” offers another nudge of convincing research in making the case that more naps and vacations – and less frantic juggling of overwhelming demands at an unsustainable pace – lead to better output in the work world, and that the best way to get more done may be to spend more time doing less. The “work when you work and rest when you rest” philosophy, accepted much more in Europe, has no patience for the American pastime of guilt associated with vacation or the drive of “more, bigger, faster”. This article suggests that working long hours and skipping vacation days is not equivalent to positive outcomes and results in the workplace. A new and growing body of multidisciplinary research shows that strategic renewal (longer sleep hours, more frequent vacations, more time away from the office, etc) boosts productivity, job performance and – of course – health. A recent survey found Americans left an average of 9.2 vacation days unused in 2012, up from 6.2 in 2011. Maybe this research can turn the tide of the oddly placed bragging rights that accompany unused or working vacations and frantic schedules, and introduce the idea that a siesta (even short) is nothing to laugh at. The crèche – a representation of the nativity scene – is an art form I look forward to this time of year. When living in Italy, I carefully selected beautiful hand-carved pieces of shepherds or sheep to take back home as gifts, and always enjoyed viewing the life-size presepio featured in Italian piazzas. Much more civilized than a plastic blow-up of the Grinch, I say. This weekend I visited a local festival which featured hundreds of crèches from around the world. Believers, non-believers and everyone in between, with a curiosity for travel and world culture, will appreciate the diversity found in crèches from places like France, Mexico, Italy, Peru, Columbia, Guatemala, Zimbabwe, Alaska and Hawaii. Faceless, abstract, figurative, stained glass, pewter, wood, cloth. Of particular interest, a cold-weather (!) nativity scene featuring arctic fox, seals and polar bears from Alaska (not shown). A crèche created in layers into a colorful and painted gourd from Columbia. A crèche made from a coconut shell, Hawaii. Gourd nativity from South America. Miniature dark-skinned Joseph, Mary and tiny Baby Jesus made of clay. From Peru. Stunning dark wooden crèche from Zimbabwe. The variety of interpretations of the nativity scene across countries and cultures provided a beautiful display and a joyful experience. My memories of crèches growing up include the above display at our local church and an elegant and simple nativity scene filled with German carved wood figurines that my mother always placed under our Christmas tree at home. Do you display a crèche at the holiday season? What kind? 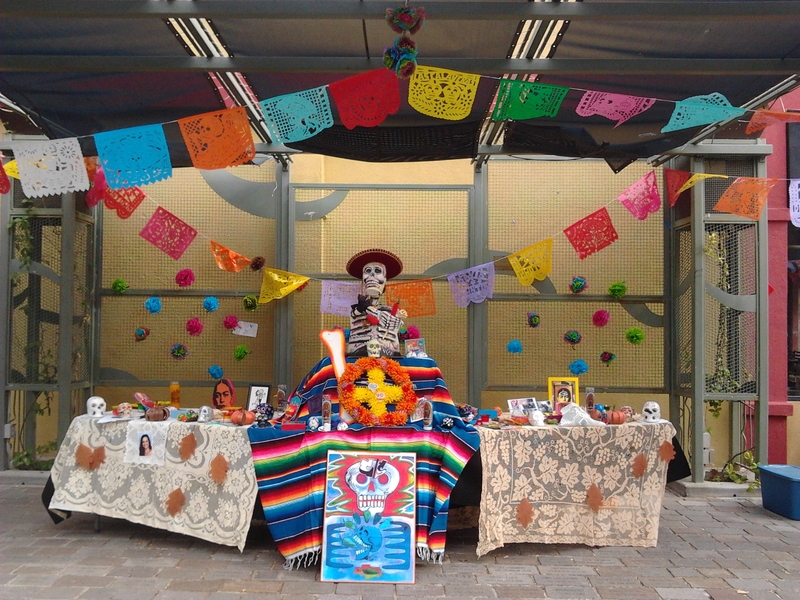 El Dia de los Muertos, or Day of the Dead, is a joyful, Mexican celebration of life and remembrance of those who have passed. Its present-day form – which originated from Aztec roots in Mexico and later transformed into a Catholic celebration after the Spanish conquest – is celebrated in many parts of the world (including here in the U.S.) around All Saints’ and All Souls’ Days. 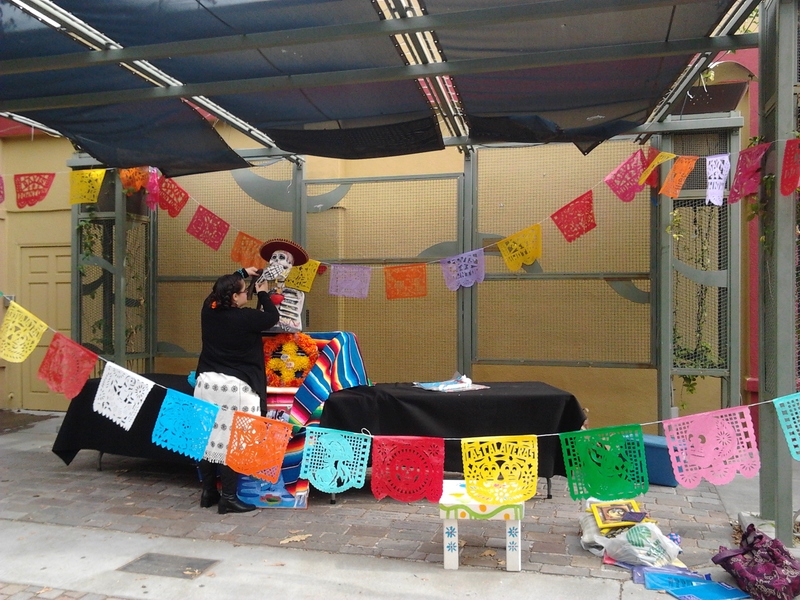 This year I had the opportunity to volunteer and partner with local downtown business leaders in planning our city’s first-ever Dia de los Muertos Festival, which featured an outdoor community altar. 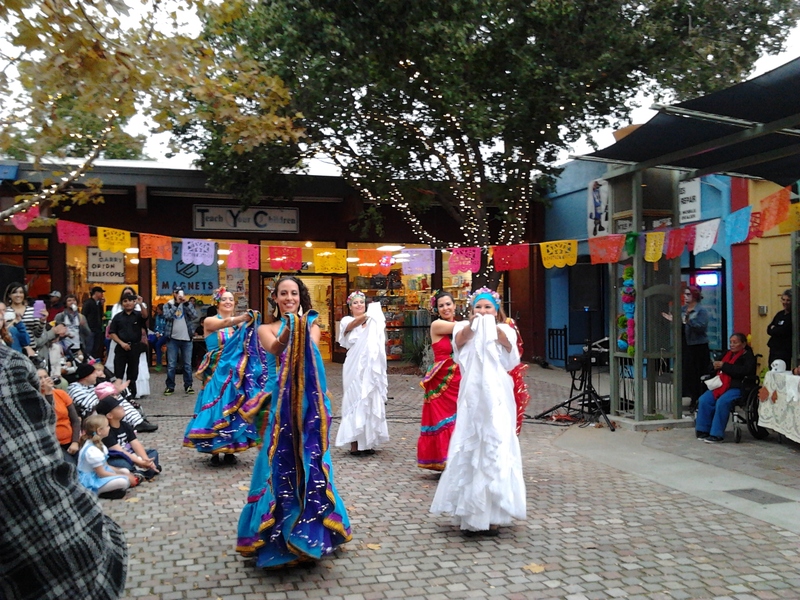 The day was full of good energy, people enjoying traditional food like pan de muertos and hot chocolate, and entertainment including a procession, a bilingual children’s choir, a Mariachi band and a Columbian dance performance. A local bilingual Chicano poet did a reading and led us in the native traditional calling of the “Four Directions” while burning sage as an offering to our ancestors. Each of the Four Directions – North, South,East and West – symbolize an element, like air, fire, water and earth. I am especially proud of how our community – at times mocked for our preoccupation with being politically correct – comes together and embraces different cultures in our community. I wonder what effect the excessive concern with offending various groups of people has on the experience and richness of many beautiful traditions. 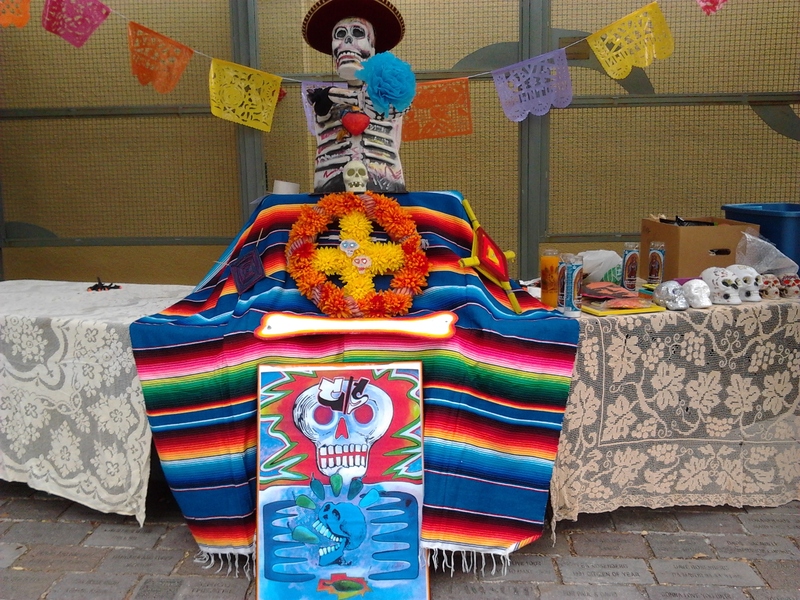 Some people came to the festival because they were simply curious, other came seriously prepared with altar offerings. In Mexico, they build altars at the cemetery. 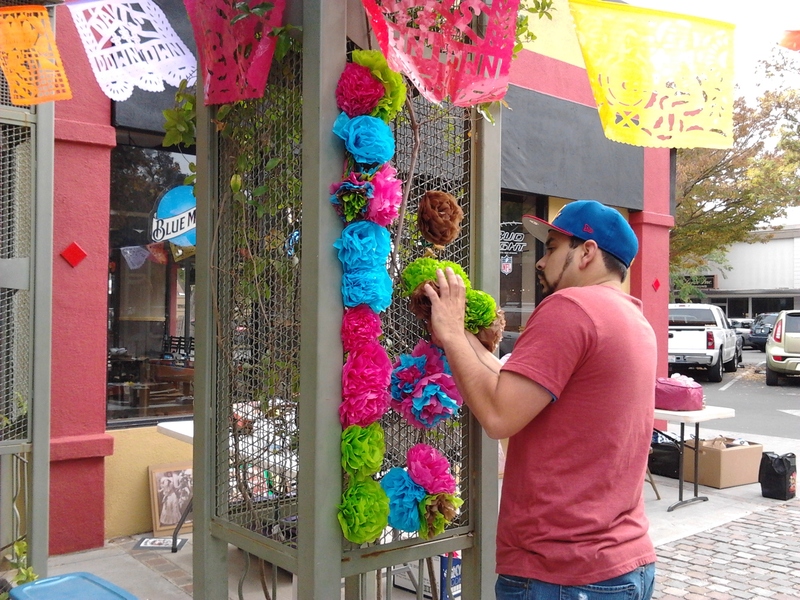 These images show our altar being built at an outdoor plaza downtown. This holiday has always been one I’ve looked forward to. An excellent source of information about Day of the Dead can be found at this NPR article that decodes its many traditional symbols and provides some history. 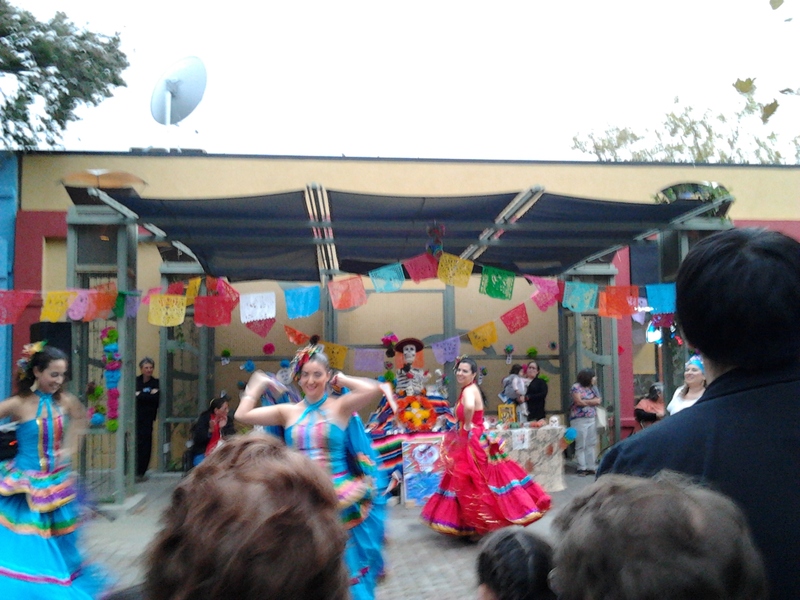 For example, it explains that papel picado – the bright colored tissue paper hanging over the altars and streets – symbolizes wind and the fragility of life. 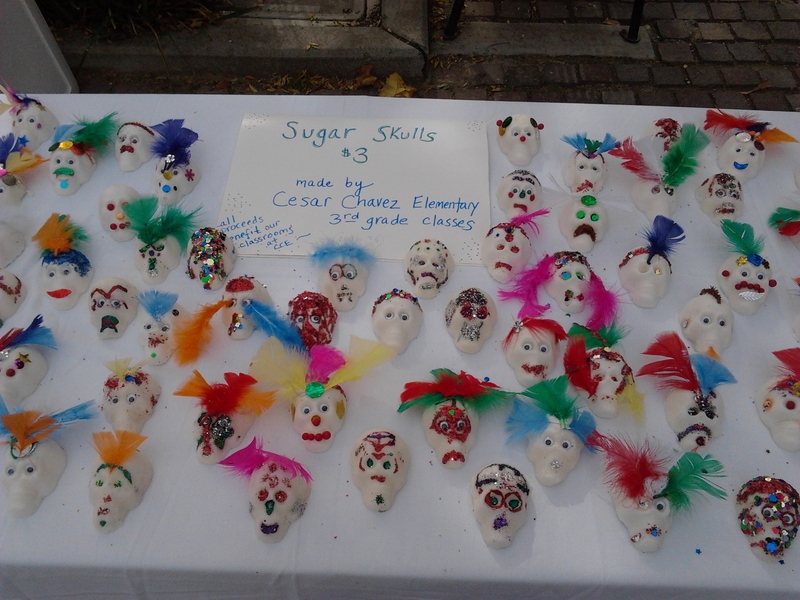 You can also read my post on a beautiful El Dia de los Muertos art exhibit I visited here. 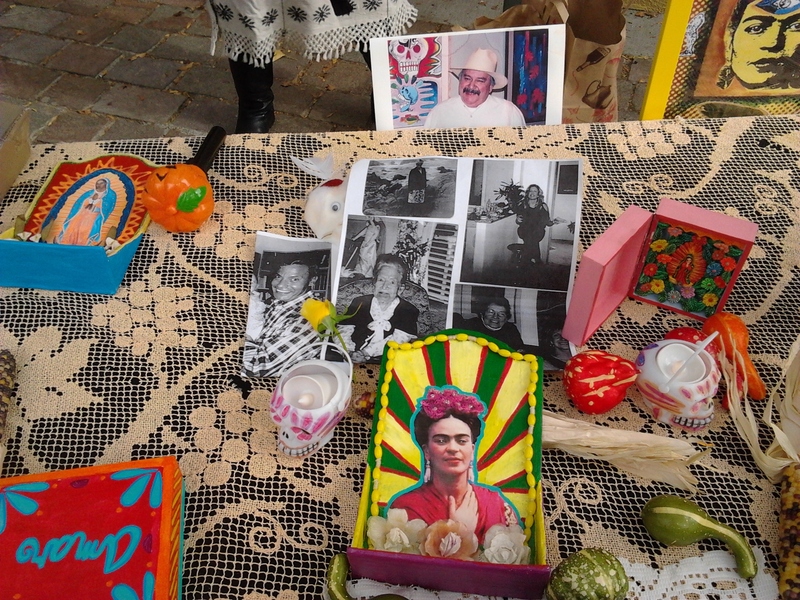 While I left my ofertas on the altar – some photos, a rose for my gardening papi, an old Italian lira coin for my friend and Italian travel companion who left us too soon- my mementos joined so many more photos and items left by others throughout the day. There were pets and grandparents and young people. Everyone had their own story. They were part of the day. They are part of our lives. On the altar. 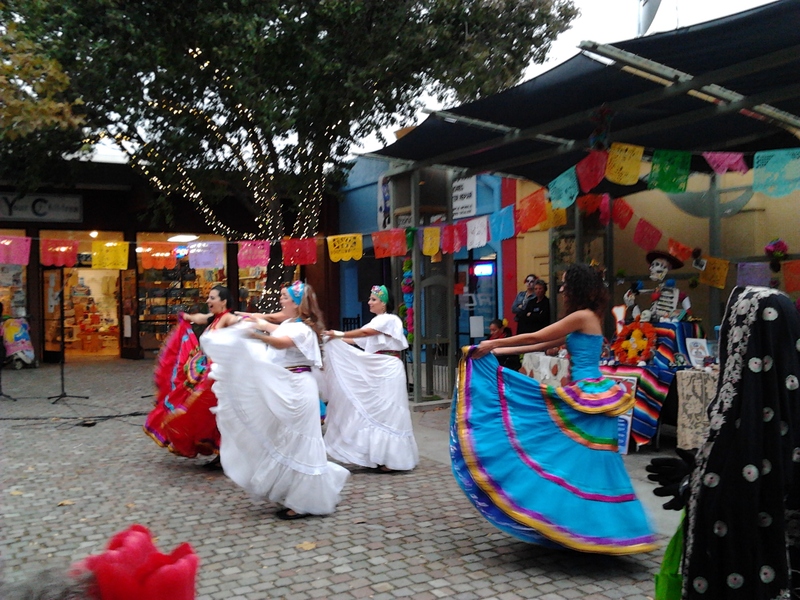 And on the plaza, laughing, dancing, talking with each other. A beautiful moment of shared humanity. I’m interested in words. 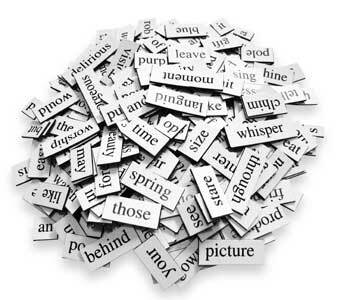 Language is fascinating – its history, progression and influence. I’m curious how certain words came to be and where they came from. The idea that if Dante Aligheri were alive today, we would have a conversation in his little-changed Tuscan Italian is mind-blowing. I’ve read that the Italian greeting “ciao” comes from the word “schiao” – Venetian dialect shortened for “sono vostro schiavo” or “I am your slave.” “Salve” – a greeting used frequently in Northern Italy where we lived but unfamiliar to most people outside the region – comes from the latin verb “salvere” or to be in good health. Then there are informal contractions used out of context or awkwardly. I lie awake at night when my Italian PhD student friend and European business owner-acquaintance use the English word “wanna” in their written correspondence. I haven’t had the heart to confront them, but my insides knot up to see an inappropriate use of “want to.” But, somewhere and somehow Euro-English – the official language of the European Union – has decided that “wanna” is okay – even in formal correspondence. But I digress. It’s interesting to hear how words have been borrowed and imitated and transformed by foreigners. When I taught Business English in Italy, I heard “chattare” ( an Italian verb rooted in the English Internet word “chat”), along with “stress”, “weekend”, “computer”, “video”, “blog” and “clic.” I would love to collect these words in some sort of index or glossary. Which brings me to Hobson-Jobson. More than 100 years ago Yule and Burnell collected more than 2,000 entries – with notes – of Indian words borrowed, used and sometimes changed by the English living there. 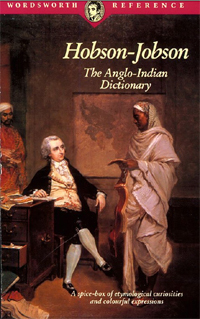 This legendary dictionary of British India was called the Hobson-Jobson, a scholarly but fun glossary published in 1886 – and lists Anglo-Indian words like shampoo (from the Indian word “champi or head massage), bungalow, pyjama, curry and bangle. The book also – perhaps indirectly – gives us a historical and social snapshot of the relationship between the two countries. The book can be seen as a memoir, BBC News writes, of colonial India. Word lovers can get their hands on a new edition of the Hobson-Jobson next year launched as part of the Oxford World Classics Series. You can learn more about it here via BBC which is broadcasting a radio program focusing on the ever loved Hobson-Jobson. I just watched the excellent biography film Coco Before Chanel about the early life of Gabrielle “Coco” Chanel. Before watching this film, I knew very little about the woman behind this powerful fashion brand. I have read about her in my favorite books about the 1920s Lost Generation expats because she was a great friend to influential writers and artists living in France at that time. In fact, it has been written that American expat Gerald Murphy’s resort wear inspired Chanel. But, above all, I have always liked the understated sophistication, casual elegance and practical design associated with Chanel, even with little knowledge of the incredible history behind the name. Coco Before Chanel (2009, French with subtitles) focuses on Coco’s early life and her rise from orphan to seamstress to cabaret singer and ultimately the queen of Parisian haute couture. 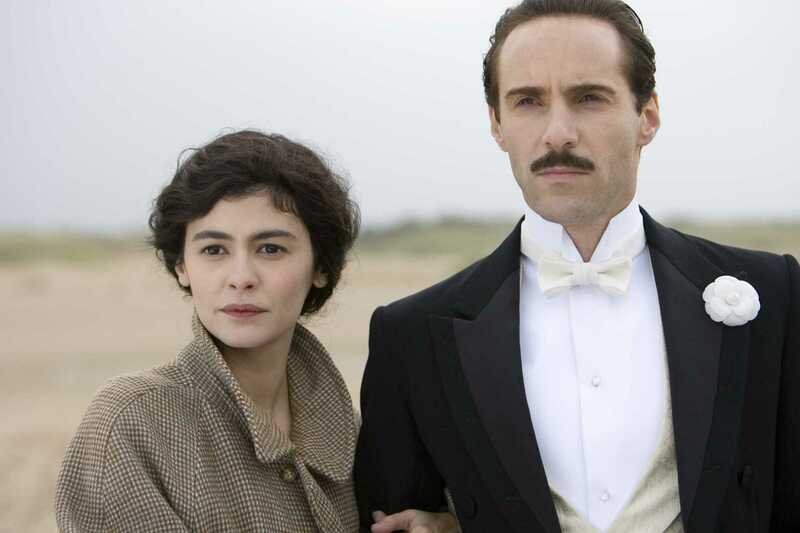 Audrey Tautou plays the legendary French designer brilliantly. 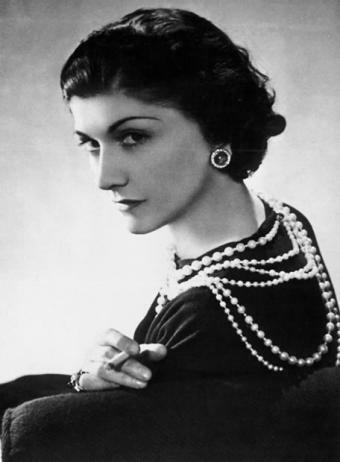 Rags to riches stories always make an impression on me, and Coco Chanel – an orphaned child of a laundrywoman mother who died when she was 12 and street vendor father who gave her away – struggled in her early years but was ambitious, rebellious and ahead of her time. She became an adult in the early part of the 1900s in a male dominated world at a time when women were not expected to work. Instead, girls “like her” – poor and orphaned but pretty – entertained and sang and danced in clubs and met wealthy barons who financed a leisurely life in exchange for mistress or entertainer. Many women gladly settled for this kind of life. While Coco indeed preferred the life and freedom of a mistress than a wife’s life (not an enviable position back then) and she knew without apology that men of status and wealth do not marry girls like her from impoverished backgrounds, she wanted more than to be a mistress. Her wealthy lovers proved to be instrumental in setting her free to pursue her talent in style and fashion. Whatever she became later in life – with reported wartime controversy and scandal and life among aristocracy – the film Coco Before Chanel portrays Coco in her early years as a gutsy, rebellious woman from a disadvantaged background but with a great sensibility and ahead of her time. A pursuit of expensive simplicity and her many trademarks – the Chanel suit, the little black dress, Chanel No. 5 perfume, and the marinière or sailor blouse – mark her legacy as an important and influential designer in 20th Century fashion that broke old rules of conventional fashion and invented a new way of chic. When in Italy a few weeks ago, I took note of some of my favorite Italian things that, for some reason, have not become popular culture on this side of the ocean. I sleep the best when in Italy. I owe it to the efficient tapparelle that cover the windows (they go up and down either by pulling on a cord manually or pushing an up and down switch electronically which, from experience, is a celebratory way to start a day) and make a room pitch black. 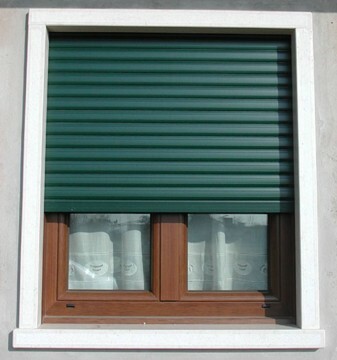 At home, blinds and curtains – even black outs – don’t keep the sun out and I wake early, particularly during summer. Italians transplanted here or on vacation will complain of rooms that are too light and how they are prevented from a good night sleep. I am convinced, like the bidet, tapparelle is an item searched for stateside, but I have yet to see one dressing a house window. For a country that invented the personal computer and put a man on the moon, my neighborhood’s decorative, can’t-shut shutters on windows blasted with the hot California sun are an embarrassment. 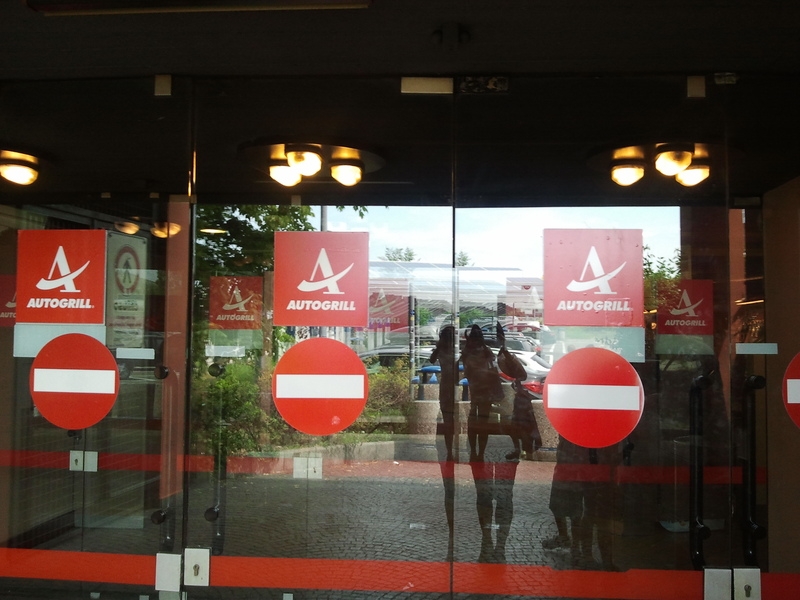 I was as excited to see an Autogrill off the autostrada again as the Duomo in Florence. Seriously. I almost cried. It’s a consistently quality restaurant off the autostrada (or highway) that will serve you a fresh, delicious prosciutto crudo and rucola panino and one of the best espressos in all Italy. While we have Subway for fresh sandwiches, this all-in-one, easy-exit-off-the-autostrada restaurant & store has also been our go-to place for replacing lost sunglasses or picking up the latest newspaper. 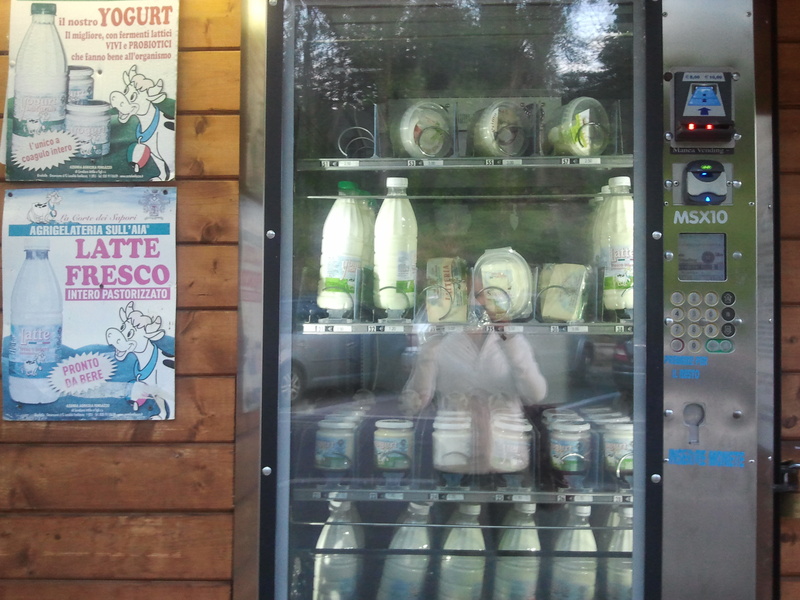 This trip is the first time I stumbled upon a vending machine for fresh milk. I found one just outside the train station in Desenzano on Lago di Garda. Stepping out of the train, my kids plugged their noses and I smelled what I thought were cows. My guess was right. The milk, we were told by a local, comes from the cows in the area. We have 24 hour convenience and grocery stores but I’d choose the fresh, local latte vending machine any time. Finally, the machine used at the Italkmark grocery store deli to cut meats like prosciutto crudo is different than here, and I continue to wonder if it’s operator error or the machine that cuts of prosciutto just plain wrong, even in the fanciest American grocery store. There’s nothing worse than walking out with fifteen dollars worth of too thickly sliced proscuitto crudo. But I’ll save that for another day.